I'm giving away fame on my blog. Please check it out. Thanks. Is that drool?? Who knew cats drooled! That is a beautiful cat...a bit fluffy for a siamese but not fluffy enough to be a himalayan...cute photo and as usual no witty caption form me! Someone will not live to see anither feeding. I been asking for my very own pet goldfish for a long time. But I cannot have one until Harley stops playing with water. This makes me sad. 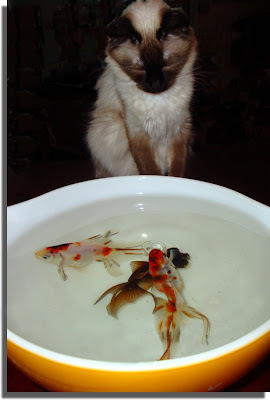 My cat Gandhi would be the first to fish one out of the water and start to gnaw on it. The other two may follow suit soon. I think that's too much temptation. Pretty cat, by the way. you need to make that a block letter caption, it should go straight to the front page on icanhascheezburger in no time! Feefifoto: Ha! Saying grace indeed! I shall pop by your blog, thanks! KarenMeg: Yes, she was transfixed alright! Beetle: She was tempted, but didn't act, thank goodness. Hi DJ! She's a Ragdoll, a breed that's only been around since the 60s. Carole: And she was good; I snapped off a dozen or so shots, and she never even tried to dip her paw in the water. VE: Me too; and a tad less wiggly when I eat them. Hussy Housewife: Ha! Well, after the photo shoot, a safety cover was put back on until their aquarium was cleaned. So all three survived the experience. Oh Daisy, that's too bad. But you know, our fish are all in covered aquariums so Tawnee (in the photo), Sheba and Dakotah don't get to go "fishing". I hope one day you get some too! The Finely Tuned Woman: Tawnee was very good; she never even tried to catch them, she just sat and watched! Ashley: Ha!!! You think??? Do you watch The Big Bang Theory? It's hilarious and they mentioned ICHC last week! This passes for Cap'N Crunch in Indonesia. Dani: Aw, thanks! She IS a sweetheart. Moooooog35: Yikes! I no longer want to eat Captain Crunch. Ever. Those fish ARE alive, right? Thinkingofyou: Fishies are fine; they took the whole procedure well, as usual. I can't seem to get their aquarium really clean with the silly things still in it; they keep bumping into my hand. Stupid fish. It's dinner and a show!